The launch of a Soyuz rocket with a Progress refueling and resupply freighter was aborted seconds before liftoff Thursday in a rare scrub for Russia’s workhorse rocket, delaying the start of a journey to the International Space Station until at least Saturday and thwarting plans to test out a new automated fast-track rendezvous sequence. 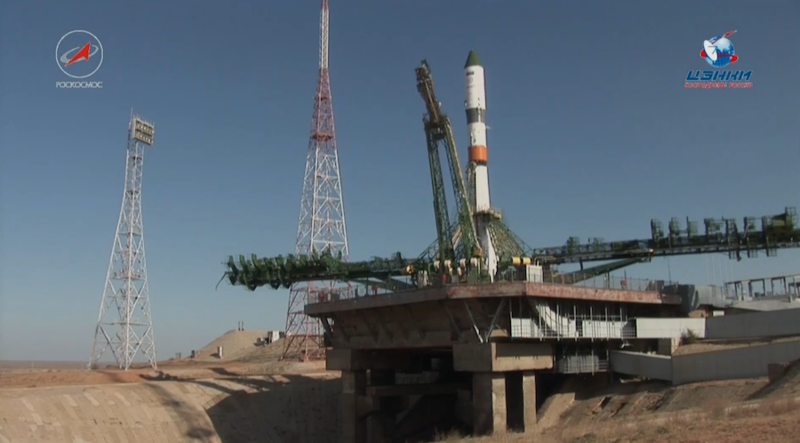 The three-stage Soyuz booster was scheduled to take off at 0932:03 GMT (5:32:03 a.m. EDT), an instantaneous launch opportunity calculated to allow the Progress MS-07 supply ship make an expedited three-and-a-half hour trip to the space station. But the countdown was halted before ignition of the Soyuz rocket’s main engines, and the launch time came and went without liftoff. One of two retractable arms detached from the rocket in the final minute before launch, but the second umbilical connection, which normally pulls back around 15 seconds prior to liftoff, remained attached to the Soyuz booster. 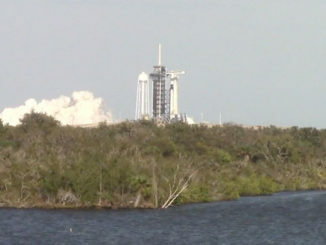 Russian space officials confirmed the abort and said that the launch will not occur Thursday, but they did not release any immediate information on the cause of the scrub, according to Rob Navias, a NASA spokesperson providing launch commentary on NASA TV. The next launch opportunity will come Saturday at 0846:53 GMT (4:46:53 a.m. EDT) Saturday, Navias said, relaying information provided to NASA by Russian mission control. The Progress cargo freighter will not be able to reach the space station on its planned two-orbit trajectory with a launch Saturday. 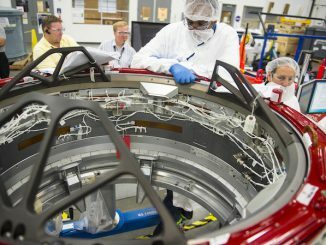 The mission will instead revert to a two-day, 34-orbit rendezvous profile, resulting in a radar-guided docking Monday. Russian engineers hoped to test out a new fast-track approach to dock with the orbiting research outpost less than three-and-a-half hours after liftoff, a record-fast rendezvous for the International Space Station program. 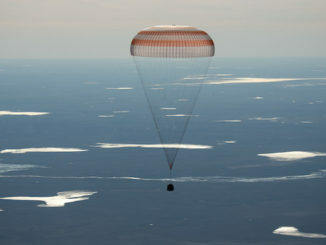 Most Progress resupply flights and Soyuz crew missions currently make the trip in about six hours, an improvement over the two-day rendezvous sequences typically used early in the station program. Officials hope to use the express approach for Soyuz crew ferry ships in the future, once demonstrated on unpiloted Progress missions. The change will reduce the workload and time spent inside the cramped Soyuz capsule for future station crews. The Progress MS-07 resupply mission will deliver around 2.9 tons (2.7 metric tons) of fuel, oxygen, air, water and spare parts to the space station’s six-person crew.